Sweet potatoes have been haunting me. They are inexpensive and we don’t eat enough of them. I don’t know why, but many of us only eat them at Thanksgiving. Is it because they look funny? I wonder what the first human thought when they dug it up. I doubt it was, “yum!”. I love your site and had an epiphany last week that I wanted to share with you. I was on a juice cleanse, a silly thing to try but my friends raved about it and I was curious (my verdict - waste of time & $). Anyway, I was starving and fantasizing about food and I had this idea pop into my head - sweet potatoes and peanut butter. For breakfast. It works! I roasted cubed sweet potatoes, and put a little dollop of peanut butter on top. It's amazing. I was just having some at work and our resident McDonalds fan called over to me "What are you eating that smells so good??" Sweet and savory, fiber and protein. My mouth is happy and my tummy is full. Hey, that sounds pretty good! Skip the oatmeal and have some roasted sweet potato ready to go for breakfast. I love the peanut butter addition. Sweet potato is very versatile. You can go the “pumpkin pie” route and add nutmeg, cinnamon, or cloves. You can choose to add Indian spices such as cumin, cardamom, or ginger. Or you can go Mexican and flavor with chile powder and lime. There is a ton of vitamin A, a bunch of micronutrients, and 37% of your daily value of vitamin C in every sweet potato. The recipe below tastes like dessert, but feel free to eat it anytime of day. 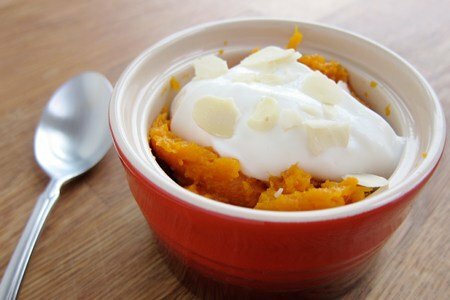 The yogurt adds some fat and creaminess to the dense sweet potato. Think of it like a pudding with cream on top. Mash sweet potato in a bowl and mix in cinnamon. Top with yogurt and almonds. Enjoy! To bake sweet potato: Heat oven to 400F. Make fork holes in the sweet potato and then place on an aluminum foil lined baking sheet. Bake for 45 minutes to one hour until soft. Another great way to cook sweet potatoes is in a slow cooker. Prick each one (you can put in as many as fit in one layer on the bottom of your slow cooker), put in 1 tablespoon water, cook for 4-6 hours on low or until they are tender when you poke them with a fork. You have enough for the week! I've never thought about yogurt on sweet potatoes -- Something to try! I wonder if the same could be done with winter squash to make the WW ppv lower? If you put some unsweetened applesauce on a sweet potato it almost tastes like pumpkin. Thank you Snack-Girl for trading the peanut butter for yogurt! Sounds great. Jan, I add cinnamon and yogurt to acorn squash for breakfast (or any meal) and it is good hot or cold - and very low points. This would work well with pumpkin also! I know you'll all think I was smoking something but honestly takes a baked sweet potato and top with crab meat and munster cheese, pop back in oven until it melts and IRS amazing. Odd combo but got to try it. These ideas are amazing! I've been eating them with a dollop of plain Greek yogurt and a splash of tabasco. Yum! I LOVE sweet potatoes! I bought a huge box because they store so well. I love baked sweet potato fries or sauteed until the skillet. Yum! I love my sweet potato with cottage cheese. I mash the SP and add a little honey and crushed almonds, mix it up and have a quick, easy, healthy meal. I tried a Laughing Cow Cinnamon Cream wedge on my baked sweet potato last night. It was a great alternative to butter. I bought some LC Strawberry Cream today - maybe that would be an ever better twist! SG- about how many cups of sweet potato is that? Because they vary a lot in size. And i LOVE Sweet Potatoes! Could eat then anytime, seriously. Boild is good, but they taste best grilled :) or in the oven. My favorite is with a dollop of cold greek yogurt :) reccommend it!! I really like a tablespoon or so of hummus on a sweet potato. Adds flavor and protein, plus a little bit of healthy fat for staying power! This sounds great. I love sweet potato, but don't have much of a repertoire for cooking it. I will definitely give this a try. I also have some canned organic pumpkin and have been thinking of making a light custard with it. Love your site but never posted before! How many grams is half a sweet potato? Im from ireland and they're HUGE here! I love sweet potatoes and they have more potassium than bananas. I like almond butter and cinnamonn on them in the morning. The volume of sweet potato is about 4 ounces, 1/2 cup, or 113 grams. Thanks so much for the questions - sorry I wasn't clearer. Now I'm looking forward to a new treat by trying sweet potatoes with yogurt and nuts or laughing cow cheese! Thanks for these ideas!! Just tried the peanut butter idea. Ohhhh it's good! Thanks!